I remember reading a story about Henry Ford some years ago. He got some of his employees to go through old Model Ts in junkyards and find the parts that had never worn out. If there was some component that was still intact in all those old cars, there was a problem with it. It was too perfect. There’s no point having an axel that’s still perfect after the rest of the car has worn out – that’s just wasteful. So he’d then set them to work to make a cheaper and less perfect axel. The competitive market is a rather ruthless and cut-throat thing. It doesn’t tolerate waste. If you’re a supermarket and you have really short queues, that means you’re employing too many staff. Your competitor, with slightly longer queues, can undercut your prices and steal your customers. If you’re an airline and you offer seats with lots of legroom, you can’t fit as many passengers in and you can’t compete with the prices offered by other airlines. In a competitive market, companies are always looking for ways to make products better and cheaper. When they do, they capture a momentary advantage. Then their competitors copy what they do or work a bit harder to capture the advantage back. That must be tiring. I’d like to take long lunches at work. I’d like to leave a bit earlier. I think we all would. But we’re in a competitive jobs market that won’t tolerate that wastefulness. Unfortunately, we tend to like things that are wasteful, they’re the things that are really good. Short queues, lots of legroom, long lunches. What made me think about this was reading this document (pdf) about the successes of salinity emissions trading in the Hunter River, north of Sydney. It proudly proclaimed "The scheme has resulted in a significant improvement in water quality in the Hunter river – it’s now fresher than most bottled mineral waters!" My first thought was "That’s not an indicator of success, it just means that they’ve set the allowed emissions at an inefficiently low level: you don’t need river water that’s fresher than bottled water and what’s the cost to industry of complying with standards that stringent?" Oh dear, I’m thinking like an economist. I’m overstating this a bit. After all, markets have niches and these include niches for higher-priced, higher- quality products and services – and maybe lower-paid, longer-lunch jobs. Nevertheless, I’d say this. I think that most industrial countries have done a very good job over the past few decades of promoting market reforms and removing inefficiencies, getting rid of monopolies, fostering competition. Ultimately, it’s made most of us materially better off. It’s a good thing. But I understand people who get nostalgic for a world of, well, unjustifiable inefficiencies: short queues; legroom on flights; long lunches; cars made to be great, not made to be just good enough at the lowest price. It does sound pretty nice, doesn't it? We face all sorts of risks in our lives. As individuals, there’s risks to our health and safety, our businesses and our homes. We take sensible actions to deal with those risks. We weigh up the risks, their likelihood and potential impacts and look at what measures we can take to minimise or deal with the risks and what those measures cost. If we own a house, we’ll put decent locks on the windows and doors and take out insurance covering the risk of break-ins and theft. If we have a particularly valuable house or live in a particularly crime-prone area, we’ll consider more expensive protection – alarms, fences, maybe even some hounds. One of the things that I think many people miss in the climate change debate is that it’s largely a debate about weighing risks and costs: the likelihood and possible impact of a changing climate and the measures we could take to deal with the problem - the likely costs of taking action compared to the likely costs of not taking action. It sounds obvious but it’s routinely ignored. It follows that we need good scientific advice to tell us what the likely risks are, and good economic or financial advice to tell us what they will cost, what measures we can take to mitigate or adapt to climate change and what they will cost. What are the risks? What will it cost? It annoys me when I hear people say that we must do whatever it takes to avoid climate change. It also annoys me when I hear people say that we should do nothing about climate change until we really know for sure that it’s a big problem. Does the first group have security guards at their homes and surround them with barbed wire fences? Would the second group leave their house open when they go away for a weekend unless I can prove to them that someone will steal their stuff while they’re away? What probably annoys me most is the disingenuous conservatives who claim that the market economy is so marvellous at adapting to shocks that we don’t need to worry about a changing climate – we’ll just adapt and it will all be very efficient and painless – but God forbid we should sign the Kyoto Protocol or aim to reduce emissions or do anything to increase the cost of energy, because that’s a shock we just can’t cope with. An important document relating to the economics of climate change will be released tonight (Australian time). It will help inform the debate about the risks and costs of climate change and the risks and costs of taking action to reduce climate change impacts - by putting some numbers on these costs. In July last year, the UK government commissioned a review, headed by development economist and former World Bank chief economist Sir Nicholas Stern, to review the economic, social and environmental consequences of climate change, as well as possible actions to adapt to the changing climate and the costs associated with them, and the costs and benefits of actions to reduce the net global balance of greenhouse gas emissions. The Stern Review on the Economics of Climate Change will be published tonight. From what’s been released so far about the Review, it has estimated that effective measures to stabilise greenhouse gas concentrations will knock about 1% per year off global economic output. That apparently means it will take an extra two years for global wealth to double. Although it sounds small in the scheme of things, that’s not a trivial cost. It is, for example, in the same ballpark as estimates of what a global pandemic would likely cost the world. But the flipside is big. Very big. The Review estimates that “business as usual” would leave to a reduction in global economic output of at least 5% - ignoring health impacts, assigning zero value to the non-economic benefits of the environment and assuming no feedback effects that result in the atmosphere warming faster and faster as greenhouse gas concentrations rise. Factoring these in, the level of climate change in the next century based on continuing current trends would reduce output by as much as 20% per year. That’s an impact, according to reports on the Review, “on a scale similar to those associated with the great wars and the economic depression of the first half of the 20th century”. The bottom line is that spending money on strong, early measures to reduce emissions is a very good investment. It’s insurance against what is looking like a very serious risk to the world that seems expensive now but, according to the Review, will seem in hindsight to be an absolute bargain. No doubt there will be plenty of analysis of the Stern Report in the coming days and weeks. Hopefully this will help inform the debate about how we should respond to the climate change threat. I'll be attending a lecture with this catchy title in Sydney next week, to be presented by Jean-Philippe Barde, Visiting Professor of Law at Macquarie Uni and former Head of the National Policies Division in the OECD Environment Directorate. It sounds interesting. It's on at the State Library of NSW in Macquarie Street in the city at 6pm on Thursday 2 November. It's free but bookings are essential. 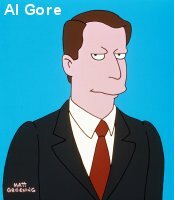 Ever wanted to be Al Gore?! Al Gore will be travelling to Australia in November to personally train 75 special people in delivering his climate change presentation, as featured in the documentary An Inconvenient Truth. Successful applicants will attend a two and a half day training seminar with Al Gore, eminent Australian scientists and expert public speaking trainers. Participants will receive the training and materials free of charge but will be required to fund their own travel and accommodation expenses. The training will be held in Sydney between November 18 - 20, 2006. Some previous experience in public speaking and presenting would be an advantage. Applicants will also need knowledge of Keynote or PowerPoint programs and access to a laptop computer and data projector. Applicants MUST be willing to commit to delivering at least 10 public presentations in the year following their training. Applications close at 9am, 30 October 2006. More details and FAQs here. Application forms here. I enjoyed reading Freakonomics but it wasn’t really what I expected. For a start, most of it wasn’t really about economics. I’m not sure exactly what to call it other than social science. It was a bit sociology, a bit epidemiology, a bit social psychology, a bit cultural studies maybe. It was essentially using statistical techniques developed in economics and applying them to other fields. It seems to be a growing trend. Joshua Gans talked today about economists doing medical research and Andrew Leigh’s blog today mentions some recent economic studies from the National Bureau of Economic Research – at least two of which I wouldn’t really say are economics at all. I’m not sure what’s driving this foray from economists into areas that other social scientists would traditionally hold. Do economists’ methods and training allow them to answer these questions better than others? Are there just more economists out there? Are economists bored with traditional economics? Is it easier to get funding to study something if you’re an ‘economist’ than, say, a ‘sociologist’? This was one of the topics I first talked about in this blog (Economists should stick to economics). I think it’s a good thing when economist apply their tools to other areas. But I do worry that economists often carry, along with those tools, a particular suite of theoretical or ideological baggage that means studies of social phenomena shouldn’t just be left to economists. Here's a convenient truth: you can see Al Gore's climate change doco An Inconvenient Truth for free. According to the Australian Conservation Foundation, travel agency Intrepid Travel will refund the cost of your ticket if you send them the stub. Details here. Ways for you to become part of a growing community of Australians committed to tackling climate change. Ted Woodruff has a daily parking dilemma that many other inner-city residents could relate to - the Richmond resident arrives home from work on most days to find every park on the street taken. Vehicles are even parked on the footpath and nature strip. Mr Woodruff has been slugged with some hefty parking fines in the past year, despite the fact that he has a parking permit. alternatively, park three or four streets away and it's not in your zone," he explains. This scene is repeated throughout Melbourne's inner suburbs. Residents in heritage properties without driveways fight for on-street parking spaces with apartment dwellers and other residents who may have a garage but own more than one car. Nearby businesses and entertainment venues also attract visitors searching for that elusive spot, adding to residents' parking woes. The article also talks about the advent of new inner-city apartment developments designed to be car-free. 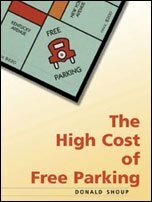 Harry Clarke has an interesting discussion of the economics of free parking on his blog over the weekend, reviewing a recent US book: The High Cost of Free Parking. The average parking spot is worth a lot more than the car occupying it and the high availability of ‘free’ workplace parking in the US effectively represents an average 22c per mile subsidy to commuters. This distorts a range of economic decisions, affecting public transport, land-use and planning and the cost of housing. An interesting argument is that so much congestion is caused by people driving slowly looking for a parking spot that an optimal policy would set the price of parking spots high enough so that there's always one available without a search. (Ie, lots of empty spots). The author of a new book on ways to better manage water says all users should have to account for the way they use the resource. John Pigram, a Professor of water policy at the University of New England in New South Wales, says farmers have already been forced to improve their efficiency to make the most of low commodity prices. He is calling for a national audit system to force users to justify their water allocations. "Whether that be for irrigation, for industry, for a wetland, or a brewery, [they have] ... to be accountable for its use," he said. "They have to specify what they want the water for, how they're going to use it and manage it and eventually audit their performance, and if it doesn't come up to scratch they either lose the water or they have to adjust their management protocols." Is he for real? He wants someone (ie, the government) to check on every single water user to check if they're using it properly, efficiently, and really truly need the water they're using? Here's an idea - how about we just charge people appropriately for water and let them figure out themselves how much to use and how to use it? The farmers who he states "have been forced to improve their efficiency" weren't forced because they submitted detailed water plans to government and government came up with some great ideas on how they could all make their water use more efficient. They were forced to, as Pigram himself suggests, because the financial pressure from "low commodity prices" made them figure out their own ways of saving water (and therefore money). How about we just stop subsidising water, let people pay the price for it that reflects its increasing scarcity, and let them figure this stuff out themselves? Natural environments and ecosystems provide a range of valuable economic services to communities. One of the contributions of environmental economics is in the field of environmental valuation: attempting to put a monetary value on the services that ecosystems provide. "Putting a dollar value on nature" inevitably attracts criticism as it seems to represent the worst of the economic way of thinking: something that’s sacred and priceless is reduced to a dollar figure. But the reality is that people make decisions about natural resources based on an assessment of the value of different uses and when the value of ecosystem services is not known, it tends to be ignored or at least underestimated. For example, the decision to clear fell an area of forest is much less likely to be approved by a government forest management agency if you can demonstrate that the value of a standing forest in purifying water entering a catchment approaches the value you could obtain by harvesting the trees. There’s good news for Australian economists and policy-makers with an interest in this area: Australia has just joined the international Environmental Valuation Reference Inventory (EVRI), which means that all Australians can access the inventory for free. (The United States, France, the United Kingdom and Canada are already members). The inventory contains details of about 1,700 international studies providing values, methodologies, techniques and theories on environmental valuation. It’s intended primarily as a tool to assist policy analysts in estimating economic values for changes in environmental goods and services. The idea is that the results of the previous studies in the EVRI can be applied, with appropriate modifications, to estimate the economic value of changes stemming from new programs or policies. This should be easier (and cheaper) than setting up a valuation study from scratch. I haven’t checked it out yet (it looks a bit technical for me!) but it should be a useful resource for any environmental economists out there. The NSW Department of Environment and Conservation has more information on the inventory and Australian data in this area.